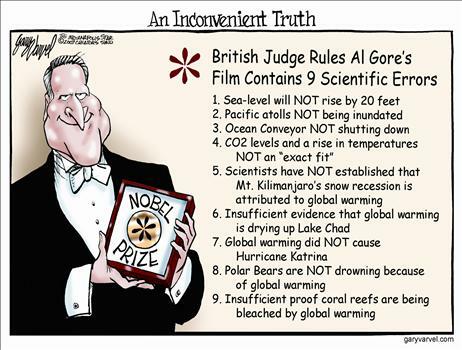 « Follow the Clues: Is Al Gore’s Promotion of Global Warming Hysteria Merely A Scam to Make Him Money? 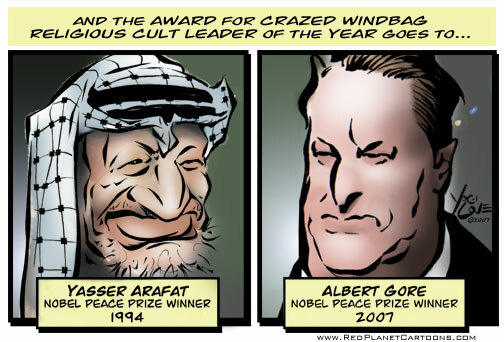 So High Priest Al Gore has won the 2007 Nobel Peace Prize. Why, how did he win it? The Jawa Report reveals who the five completely unbiased Nobel Peace Prize committee members are. 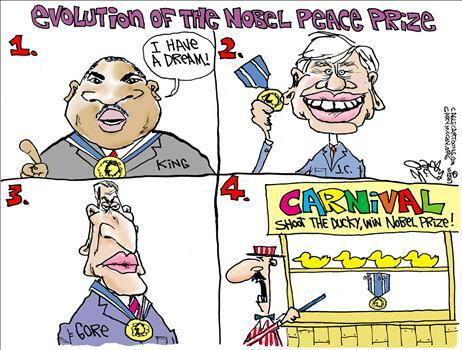 That’s right, the Nobel Peace Prize is chosen not a committee of many outstanding men and women from across the globe and political spectrum – but just a measly FIVE liberal left-leaning Europeans. Which is likely why far more deserving candidates who fit in with the usual understanding of what PEACE actually is – such as the Myanmar peaceful-protest monks, or the men who brought peace between Catholics and Protestants in Ireland, or the pro-democracy campaigners arrested by police states across the world, or the people who helped North Koreans escape the brutal prison state, or many more others – were not chosen. Instead, a left-leaning liberal Democrat who released a movie, a book, a few talks and a concert from the comfort of his mega-mansion, mega-limo and mega-jetplane was chosen as the winner. But hey, who’s complaining of biased unfair politicalness? 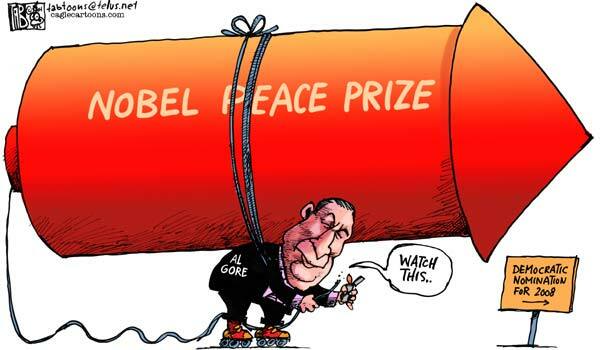 Well, what’s done is done… And so Al Gore joins the list of Nobel Peace Prize laureates who are the very definition of ‘successful peace-makers’… Such as Henry Kissinger, Yasser Arafat and Jimmy Carter. So am I, kitty. So am I. 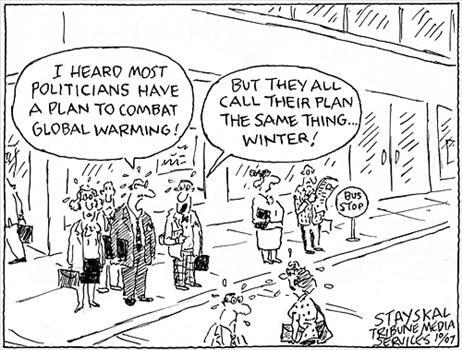 Even a prominent United Nations scientist – and member of the IPCC! – refuses to accept the Nobel Prize because it was awarded based on a misunderstanding of science. Links here and here. 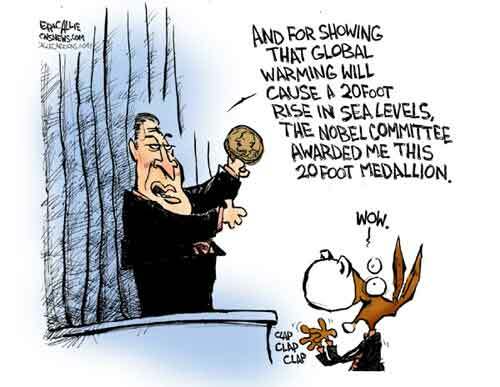 See also this post for why Al Gore’s heroic efforts winning him the Nobel Peace Prize make me wonder why Charles Ponzi didn’t win his own Peace Prize. Is It Getting Warmer? 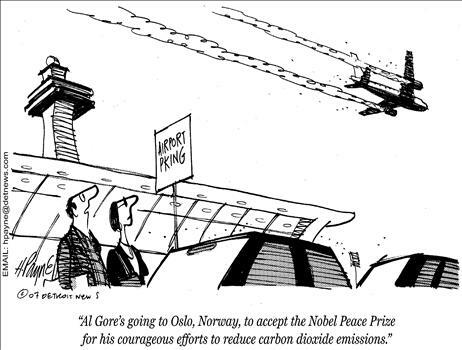 has a mix of pro- and anti- Gore Nobel Peace Prize cartoons. 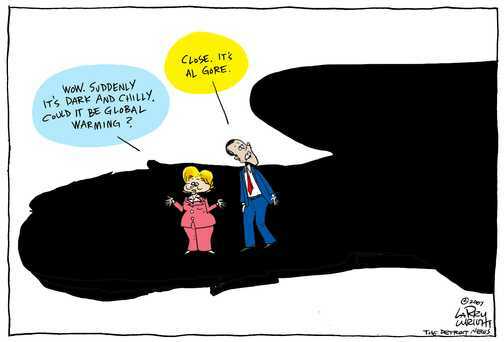 And see Global Warming Editorial Cartoons for lots more Al Gore and global warming mockery cartoons. 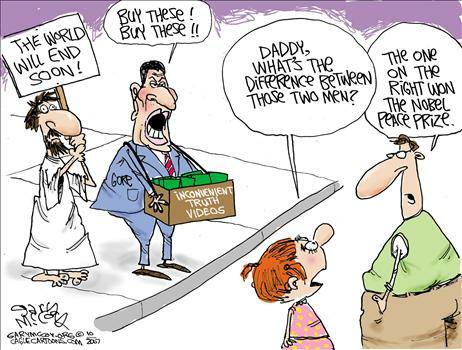 Click to enlarge most of the cartoons below. THIS is the person who truly deserves the Nobel Peace Prize: Irena Sendler. Court ruling here if you missed it. 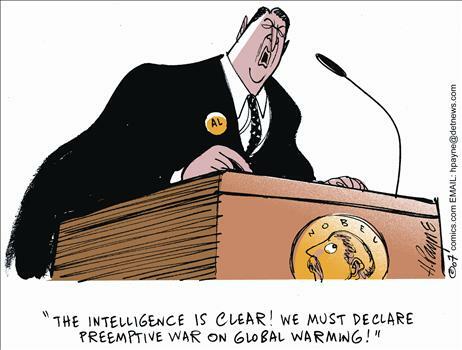 This entry was posted on October 14, 07 at 1:29 am and is filed under Editorial Cartoons, Global Warming Fears. You can follow any responses to this entry through the RSS 2.0 feed. You can leave a response, or trackback from your own site. Thanks for this. You hit the truth right on the head. 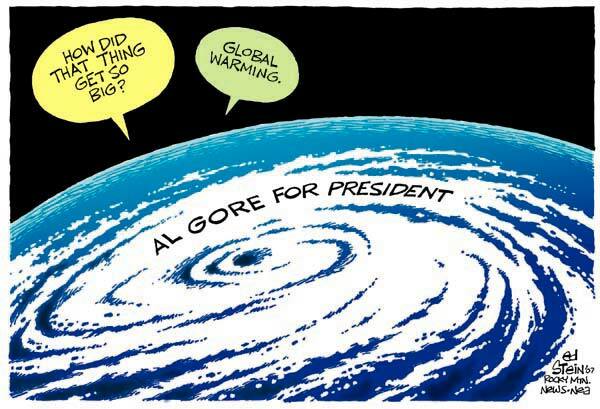 Gore is the consummate fabricator. 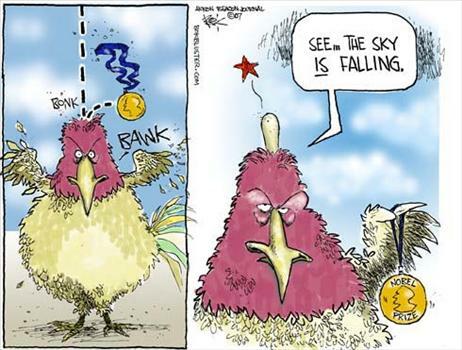 The Nobel prizes in social areas is fraught with lies and distortions to meet a political end. 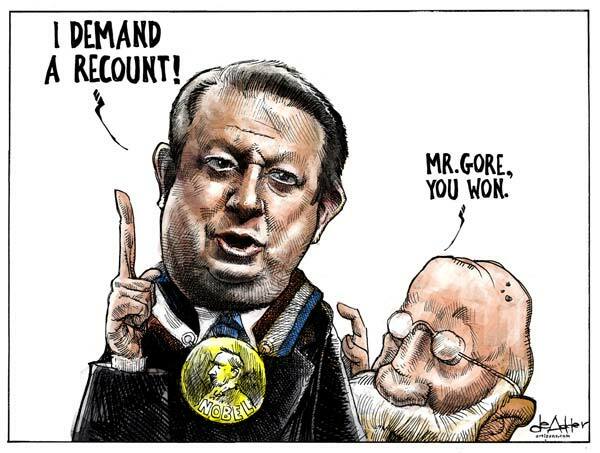 Gore fit the bill perfectly except I still can’t equate fighting a geophysical phenomenon with working toward peace. There must have been another category they could have used to make Gore look good. Thank God he didn’t get into the White House. 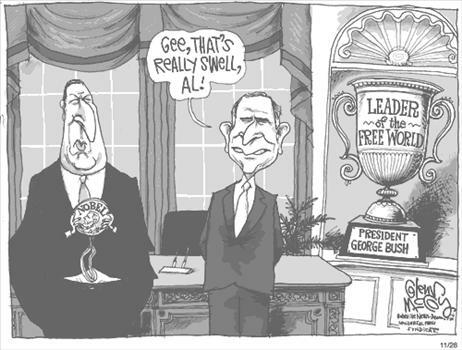 Can you imagine post 9/11 with Gore at the helm? 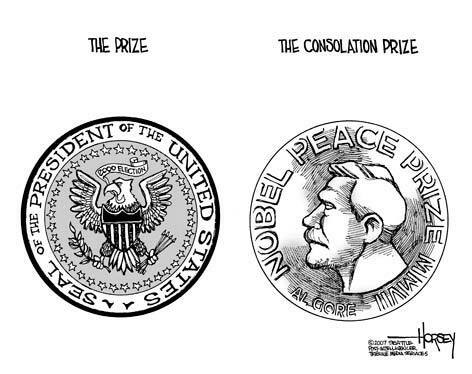 By the way, screw the Nobel Committee. Yes – thanks for putting this together – I’m passing on a link to all us ‘kindred spirits’ so we can know there actually are others who see the ridiculous and say so. 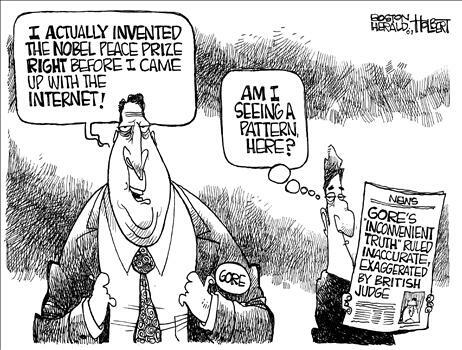 I also agree with irv lewis in saying “thank God Gore didn’t get elected -ie: post 9/11 would be so much worse a mess. 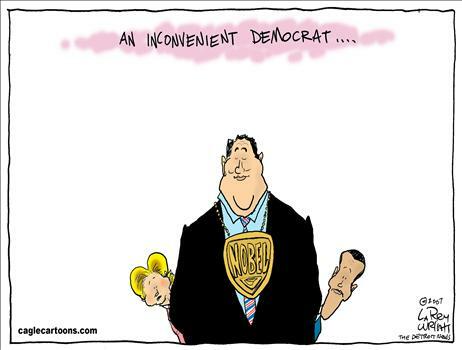 I was looking for an editorial cartoon that appeared in Detroit newspaper and didnt find it here. 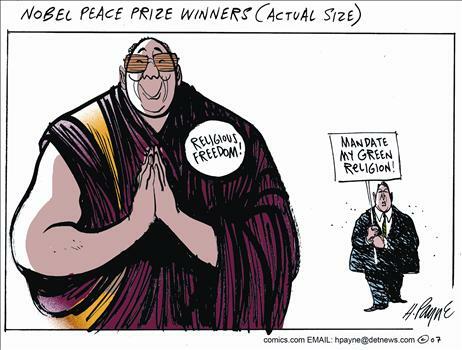 It portrayed other possible Peace Prize winners if Al can get one – hope someone finds it and adds to your list. It was a good one. March 6 (Bloomberg) — Former U.S. Vice President Al Gore left the White House seven years ago with less than $2 million in assets, including a Virginia home and the family farm in Tennessee. Now he’s making enough to put $35 million in hedge funds and other private partnerships. 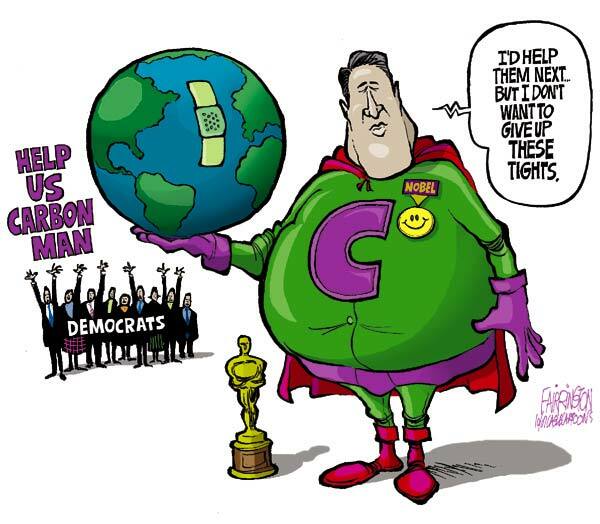 And because of him millions will die of hunger as the hedge funds played up unpredented increases in agriculturals, with Al Gore abetting with his `climate warming` drivel.